I recently took early retirement in order to pursue a new direction in my career, as a Consultant, Trainer and Mediator. 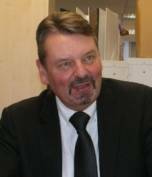 I have over 35 years experience in housing, including the last 25 years as a senior manager in leasehold management and home ownership, and I am a Member of the Chartered Institute of Housing (CIH), a Royal Institution of Chartered Surveyors (RICS) Accredited Mediator, and a member of the Civil Mediation Council (CMC Registered Mediator). I am based in Hertfordshire but also regularly work in London, Essex, Bedfordshire, Buckinghamshire and Cambridgeshire. However, I am also willing to travel further afield subject to agreement. Excellent Court, Tribunal & Mediation record. I have worked on and chaired a number of London Councils' working groups and was a member of the London Home Ownership Forum Steering Group. I was a member of the Department of Communities and Local Government's Public Sector Leasehold Working Group, and was on their working parties for the revision of the Section 20 Leasehold Consultation regulations in 2002/03 and the research into Right to Buy valuations and the development of the RICS Code of Practice in 2004/06. 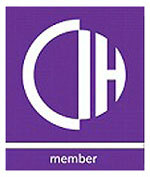 The training programmes and seminars I have delivered include Leasehold Management, Home Ownership, and Dispute Resolution for the Chartered Institute of Housing, Housing Quality Network, Leasehold Advisory Service and other public & private sector organisations, and I also chaired the 2005 CIH Home Ownership & Leasehold Management Conference. Training sessions have regularly been rated at 95% good/very good by delegates. I am now available to share my experience with other organisations in order to improve their services to leaseholders. Disputes often develop to the point where the only solution seems to be recourse to litigation. But in many cases the problem can be resolved at a much earlier stage - so long as the parties involved are prepared to engage and discuss the issues through mediation. Both parties need to agree to mediation. It depends on a mutual willingness to explore a solution and can't be imposed on the other party. If it is not successful, it does not inhibit or limit in any way rights to more formal routes to dispute resolution. A mediator does not give opinions, make judgments or try to impose solutions but is independent and impartial. I am a Civil & Commercial Mediator, accredited by the Royal Institution of Chartered Surveyors and MATA. With over 35 years experience in property management and construction, I have a great deal of experience in legal proceedings relating to disputes over property management, service charges, major building works, rent, disrepair, building surveys and boundary disputes. Fees are usually in line with Civil Mediation Directory rates and depend on the value of the dispute and an estimate of the time needed for the mediation. The cost of travel, the venue and any refreshments will also usually be shared by the parties. 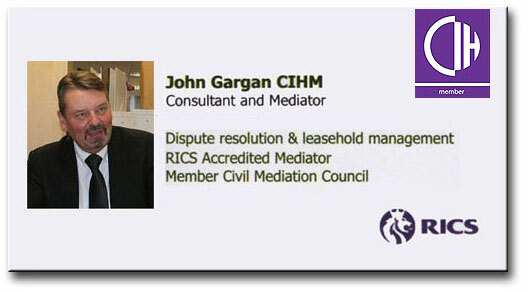 This podcast (published by The Leasehold Advisory Service) is a conversation with John Gargan, a consultant and mediator with over 25 years as a senior manager in leasehold management and home ownership. For more information about the right to buy scheme please see The official Government Right to Buy website. "John is a highly knowledgeable and experienced manager in the field of homeownership services, with considerable knowledge of Landlord and Tenant legislation and good practice." "John has extensive experience of leasehold managment and as Head of Home Ownership and Leasehold Services dealt with complex and challenging disputes. John has used his experience to be a successful mediator assisting parties to settle varied disputes." Partner at Judge & Priestley LLP. "This was outstanding. The mediator was fantastic. I cannot put into words how good a service it was. I would thoroughly recommend this process to anyone else in a similar position." "I appreciate your professionalism and patience which was so obvious yesterday without which we may not have reached an agreement. Thank you." If you think I may be able to help you to improve your services, provide interim cover for a management vacancy, or assist in resolving legal disputes, please contact me to discuss your requirements.